It looks like a really hot day in this photo! 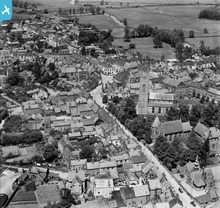 A roughly South-East view from the top of St Mary's Church tower, Bungay, towards Mettingham. A view towards Mettingham from the top of St Mary's Church tower, Bungay. The B1062 climbing Watch House Hill towards Mettingham, as seen from the tower of St Mary's Church, Bungay. Wainford Maltings, Ditchingham, with the River Waveney, as seen from the top of St Mary's Church tower. The maltings are situated off Pirnough Street, which is part of a Roman road. Grain silos at Wainford Maltings, Ditchingham, as seen from the top of St Mary's Church tower. These are situated off Pirnough Street, which is part of a Roman road. A view across to Ditchingham, Norfolk, from the top of St Mary's Church tower. In the foreground is the stand at Bungay Town Football Club, which plays at Maltings Meadow.